Mowing is a vital part of lawn maintenance, but if you have a large amount of rough terrain, it becomes a bit more challenging. A riding lawn mower is ideal for yards of a half-acre or more, but they aren’t all great for rough land. In fact, the mower you need varies depending on what “rough” means to you. Your choice will be different if your lawn is hilly than if it has a lot of landscaping or trees that will need to be navigated around. But don’t worry – we have all the details on five different riding mowers, including the type of rough terrain that they are best for. By the time you finish here, you’ll have everything you need to your personal best riding lawn mower for rough terrain. Lawn tractors are smaller and lighter, but that can be okay if you need to navigate around a lot of tight landscaping. Garden tractors are larger and heavier, which is great if you have a huge lawn or will need to do additional tasks like tilling or cultivating. Lawn tractors are meant for lighter duty than garden tractors, so they have lower torque transmissions, less horsepower, and smaller rear tires. However, lawn tractors are still strong enough to tow light equipment like carts or spreaders. A lawn tractor can also be converted to a riding lawn mower with snowblower, making it usable all year round. A lawn tractor can be great for rough terrain as long as you look for a model with a locking rear differential. Forward speed is somewhat slowed by this feature, but you gain critical traction and stability on sloped ground. Garden tractors are better for truly heavy-duty jobs. They can mow rough terrain as well as tow heavy attachments for tilling, furrowing, pulling loads, and plowing dirt or snow. Garden tractors have engines of at least 24 horses and have larger back tires to provide more ground clearance. Bigger wheels can also mean better stability on inclined land. However, if your yard contains slopes of greater than 15%, you should still look for a tractor with a traction control system or locking rear differential. These sleek machines are high-performance models that power through mowing at up to 8 mph and can turn on a dime. Their design allows for nimble 360 degree turns and easy maneuverability. They may be the most efficient mowers in terms of time spent, but there is a learning curve to operating one. Zero turn mowers are also more expensive, and usually cannot be used to tow anything because of their more delicate hydrostatic motors. If your yard has a lot of obstacles to mow around, a ZTR might fit the bill for you. 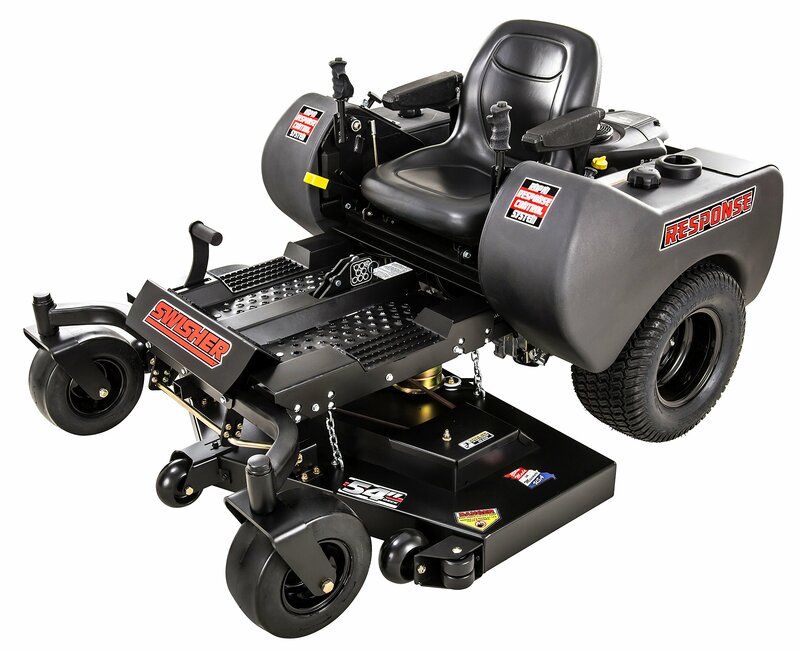 It may be the best mower for uneven ground. But if your terrain is really hilly, you’ll get better traction with a lawn or garden tractor. There are other features to think about when deciding on the best lawn mower for rocky ground, uneven ground, hills, or heavily landscaped areas. The cutting deck describes how large an area of grass can be cut on a single pass. The larger your yard, the larger you want your cutting deck to be. That means you can get the job done in fewer passes. However, if you have a lot of trees or other obstacles to navigate around, a smaller cutting deck allows you to do this more easily. There are several types of transmission that can be found on a riding lawn mower. A manual, or gear-driven, transmission is basically the “original” type of transmission. Much like a manual car, you’ll need to shift gears on this type of mower as you change speed. Manual transmissions are quite durable, but may be a hassle if your lawn has a lot of trees and landscaping to navigate around. Back on the plus side, though, manual transmission mowers tend to be a bit cheaper than those with automatic or hydrostatic transmissions. Automatic transmission mowers, like automatic cars, make your job easier because they automatically shift gears as necessary. Automatic transmissions use a belt and variable pulley system to transfer power from the engine to the mower’s wheels. There is no need to shift gears or use the clutch. An automatic transmission riding lawn mower is a bit more expensive, but may be worth it to make your job considerably easier. This type of transmission falls into the “automatic” category, but unlike regular automatic transmissions, which use a complex system of gears, a CVT transmission utilizes a pair of variable-width pulleys connected by a belt. One pulley connects to the riding lawn mower engine and the other delivers power to the wheels. The width of the pulleys changes in response to the need for more or less power. One pulley gets bigger as the other becomes smaller. This means that a CVT transmission can offer strong and seamless acceleration. Hydrostatic transmissions represent the top of the line in terms of riding mowers. They are the most powerful on the market and use fluids to shift power from the engine to the wheels of your mower. With no belts and no need to depress a pedal to shift gears, you get the smoothest ride with a hydrostatic transmission. You can also count on a very long transmission life. However, the trade-off comes with the steep price tag, and you will also need more gas and more routine maintenance with a hydrostatic transmission. This type of transmission is actually two transmissions, one for each back wheel. This technology is what allows the any-which-way maneuverability of a zero turn radius mower. It is also why ZTR machines are more expensive. But before you make an enclosed double hydrostatic transmission a non-negotiable, remember that they are not designed to pull any kind of load and are therefore not the most versatile of transmissions. Ergonomic features are those that are included in the design to make operation of the mower easier and more comfortable for you. Especially on rough terrain, you will experience some bumps and jolts as you mow your lawn. A suspension seat helps absorb the shock of those bumps so that they don’t travel up your spine and cause lasting pain. Some riding mowers have seats that are little more than perches. If you can find one with a high seat back and arm rests, you will find that you have much better stability upon the mower. If the whole seat is thickly padded, you’ll feel even more comfortable. The vibrations that you feel in your hands and arms while mowing can eventually cause numbness. Over time, it can even lead to permanent nerve damage. A padded wheel reduces the amount of vibration taken by your hands and wrists. Now let’s look at some of the best riding lawn mowers for rough terrain. Here is a handy overview of the specs on five great models of riding lawn mower. Time to dig into all the details about these highly reviewed mowers! 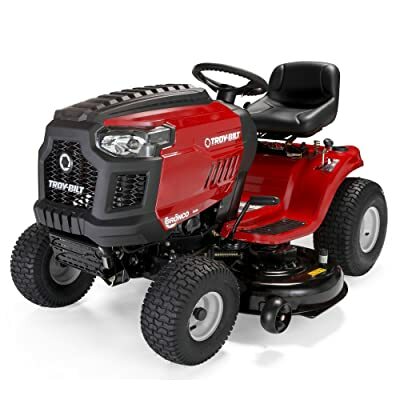 This Craftsman riding mower is a nimble model with a 46” cutting deck. It has a CVT foot pedal transmission and an 18.5 hp Briggs & Stratton gas engine. A couple of features make it good for rough terrain. The 15” front wheels paired with 20” rear wheels provide extra clearance over bumps and the nice deep treads provide additional traction without tearing up your turf. This mower also keeps the blades engaged even in reverse, allowing for nimble maneuvering around landscaping without the need to cover any ground twice. The ready start technology makes it easy to get your tractor fired up and ready to mow. You can stay nice and comfortable while you work with this Craftsman due to the mid-back seat that provides crucial lumbar support. It also features a spring suspension system to keep your ride smooth. The steering wheel is designed to provide a comfortable grip. When you’re done mowing, you will appreciate the deck washout port, which allows you to attach a standard garden hose and rinse away accumulated clippings, dirt, and other debris which can otherwise clog up the works. This mower is backed by a 2-year limited warranty. Troy-Bilt offers a riding mower that is comparable to the Craftsman in most features, but has a slightly more powerful Briggs & Stratton Intek engine with 19 hp. It is also built with a single cylinder CVT automatic foot pedal transmission, a 46” cutting deck, and 15” front wheels paired with 20” rear wheels. 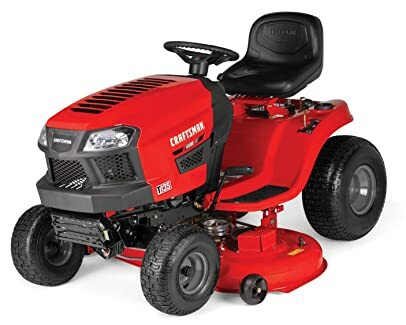 Like the Craftsman, this Troy-Bilt allows you to mow in reverse and has a mid-back seat coupled with a soft touch steering wheel for ergonomic comfort. This mower includes the ability to easily adjust the deck height to 5 different positions with a lever on the dash. That can be useful for rough terrain as you may need different grass heights in different areas, or to lower the deck to reach into dips and grooves in the land. The Troy-Bilt also has a deck washout port to make maintenance easy, and its “step through” frame means it is just as easy to mount or dismount from either side. It tops out at 5.2 miles per hour. This mower comes with a 2 year limited warranty. 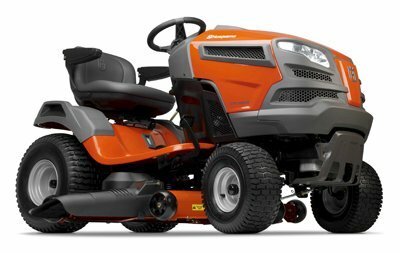 Moving up in both power and features is this Husqvarna model. The engine is a robust 24 hp Briggs & Stratton V-Twin. It features a fast hydrostatic pedal transmission for a smooth ride. A really nice extra feature is cruise control. You may not want it when you’re working around landscaping or on especially rough terrain, but it can greatly reduce operator effort on flat sections. That means less time mowing overall. You can count on this mower to deliver a clean cut every time. It has incorporated Air Induction technology to improve airflow through the deck. This not only keeps the engine healthier, but it also lifts grass blades before they are cut. The Husqvarna has some nice ergonomic features, too. The seat height is mid-back, but it also has arm rests to improve comfort and balance. And more than that, the seat is adjustable to accommodate people of varying heights. The steering wheel provides a padded grip to reduce vibrations absorbed by your hands. For all this, the Husqvarna is remarkably lightweight at just 200 pounds. However, with its powerful engine, it is strong enough to be equipped with a range of towable accessories. That makes it a great choice if you have other yard care tasks to complete. For really large yards with a lot of trees or landscaping, consider a zero turn mower for rough terrain. This one from Swisher has an impressive 54” cutting deck with 3 Gator mulching blades and can turn on a dime. It has a 24 hp Briggs & Stratton engine and a powerful hydrostatic transmission. It is built tough out of commercial-grade steel so that it can take a beating and keep on mowing. Because it is a ZTR mower, there is no steering wheel but rather two joystick controls situated on either side of the seat. That can take some getting used to, but once you have navigated the learning curve, you’ll find that this Swisher is much more responsive and can move with greater nuance than other traditional tractors. In fact, Swisher has patented their Rapid Response Control System. The mower deck can adjust to heights between 1.5” and 4.5” – this feature is controlled by the foot-assisted deck lift. Get going quickly with an electric assist starter. As you mow, you’ll appreciate the debris shield in the front, designed to prevent grass clippings from escaping from the front of the mower and then blowing back onto the operator. You’ll find some very nice extra features built into this Swisher, including a full seatback, a cup holder, and a storage bin. The 8 gallon gas tank is quite ample, giving you plenty of time between fill-ups. The mower can also power through the work quickly, with an 8 mph top speed that can be achieved in both forward and reverse! If you want to either tow or push attachments, you will be glad of the hitches on the front and back of this machine. The Swisher is made in the USA with both domestic and international parts. It comes with a nice 3-year warranty. ZTR mowers aren’t usually known for their ability to tow or haul things, but this Snapper mower has a super handy integrated cargo bed that allows you to carry items up to 50 pounds. It also features rails so that you can attach a variety of aftermarket ATV accessories. It is a durable machine overall with a fully welded steel frame, thick walled front axle, and ball bearings in the caster spindles. The power comes from its Briggs & Stratton Professional series engine with 23 hp. It has ReadyStart technology to get you going quickly. The hydrostatic transmission guarantees a smooth ride. You can count on a consistently beautiful cut with your Snapper mower. The deck height can be adjusted via a commercial-style lift, operated with your foot. It easily adjusts to heights anywhere from 1.5” to 4.5” with 13 stop positions. This ZTR has a high seat back for comfort. The dual control levers arch up and over your legs so that your hands are positioned in front of your body as you control the mower, rather than to the side like the Swisher. This may feel more intuitive for people transitioning from a standard lawn or garden tractor. Enjoy dual cup holders and a handy storage bin for keys or cell phones. Of course, there is a much larger cargo area directly behind your seat, too. The 48” cutting deck is ample, though it falls slightly behind the Swisher at 54”. Remember that a smaller cutting deck can actually be good if you have a lot of landscaping to navigate around. Rough terrain can be absolutely beautiful, but it is more difficult to maintain. Following are a few tips to keep that land looking great, no matter how many hills, dips, or trees. A scalped lawn has patches of missing grass where the ground underneath shows through. Scalping is a real risk when you have land with a lot of rolling hills, as one blade height can leave grass in dips too high but take grass on higher points all the way down to the turf. Not only does scalped ground look bad, it also allows weeds to take hold and spread. Choose a mower that has an easily adjusted deck height so that you can customize the cut to the terrain. It’s important to do this even if you haven’t already scalped portions of your lawn, because grass that is routinely cut too short will not be able to develop a healthy root system, and will gradually die off. Soggy ground is bad for mowing because the mower tends to sink into the mud, leaving ruts and making it impossible to accurately control the cutting height. It can also cause the grass to get ripped out of the soft ground in clumps. Damp grass is okay to mow, but the blades do clump together and that results in an uneven mow. Wet clippings also get stuck to mower blades and other parts, which can jam them up. Most people like to see nice precise mowing lines when they are done with the job, but you should still be careful not to mow the exact same way every time. If you can come up with a few different patterns and then alternate among them each time you mow, this helps keep your lawn healthier overall. The reason is that mowing the same way all the time causes the ground to compact under the wheels of your mower. Compacted ground does not allow grass to thrive or even survive. Like all green plants, grass uses photosynthesis to nourish itself. That means it needs a healthy dose of sun to thrive. Grass that lives primarily in the shade can still be healthy, but it needs to work harder to get enough sun – what it does get is more diffuse. When you leave these blades longer than average, there is more surface area available to absorb sun. Dull mower blades tear at grass rather than cut it cleanly. This creates a ragged looking finish, but more than that, it leaves grass vulnerable to pests and plant diseases that can spread across the whole lawn. One sign that your mower blades are too dull is a whitish or brown hue to the grass after mowing. You can avoid this problem all together by having mower blades sharpened twice per season. With the best riding lawn mower for rough terrain and a good strategy for maintaining the health of your lawn, you can achieve a beautiful and flawless look no matter how uneven the land. The type of mower you choose will ultimately depend on what it is that makes your particular terrain “rough,” but rest assured that the perfect riding mower is out there. We hope we have given you the information you need to make a selection and that you enjoy every moment this summer out there on your land.